Revealicious is a set of graphic visualisations for any del.icio.us account that allows one to browse, search and select tags, as well as viewing posts matching them. As the authors clarify: Revealicious is a graphic design project lead from June to September 2005. It was developed in ActionScript 2.0 using MTASC and SWFMill. Its aim is to demonstrate how using different kind of visualisations can reveal surprising aspects of information. 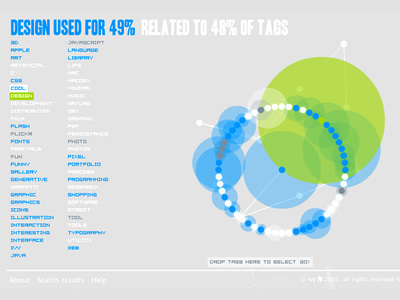 Del.icio.us was chosen as a source of data because of the unformalised semantic richness of its tag system. The images on the left illustrate one of Revealicious visualization methods entitled SpaceNav. 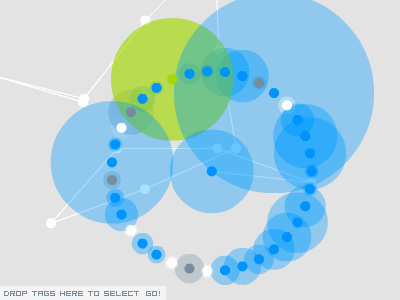 It lets the user explore their del.icio.us tags represented as an inifinite 2D space. It enables one to discover the relations between their tags, as well as recognize different patterns and characteristics of certain groups of tags.